Broccoli is a great source of many beneficial ingredients. True lovers of this green mini-tree will find various ways to prepare it. Cooked, steamed, baked, boiled, fried or even raw, all will go down well. Is broccoli ok for dogs to eat? Will broccoli benefit him or cause a severe belly ache? Are there any health conditions which area total no-no for dogs and broccoli to meet at a meal? These are all legitimate questions of a responsible owner. The kind of an owner who understands, that dogs as close to humans as they are, still differ from them greatly. Let’s, therefore, face the first important question. Is Broccoli Good for Dogs to Eat? Broccoli is a wonderful source of goodness. It contains vitamins B1, B6, E, C and A. Additionally it has phosphorus, manganese, potassium, copper and more. These are all healthy essentials. Now, we want to know if our pet can have some of this goodness. Although most dogs can eat pretty much anything they’re given, it doesn’t mean that it’s all fine for them to gobble up. As an omnivorous animal, it needs more than just meat, and veggies are an excellent addition to a balanced diet. 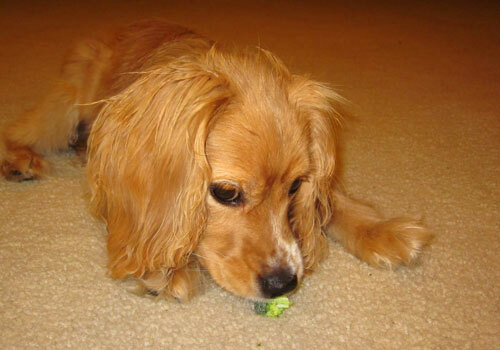 While dogs don’t need the leafy greens as much as we do, they might still like it. 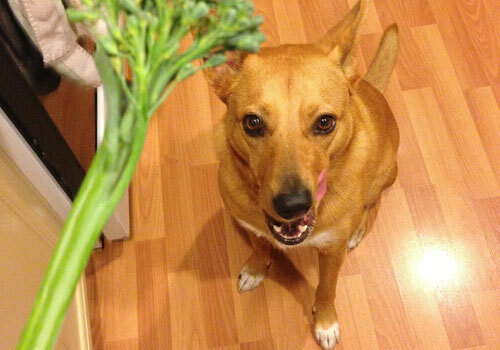 If your dog loves broccoli, then the good news is that it’s ok for them to have it. Broccoli for dogs is absolutely fine if given in moderation. If you treat it as a snack, you can’t go wrong. Small amounts will go a long way. Broccoli has been named super veggie for a good reason. It has multiple advantages. Dogs will actually reap quite a few benefits from eating it raw or prepared. Same as other vegetables, it is low in calories. It is rich in antioxidants and anti-inflammatory agents. It has the potential of helping fight cancer and allergies. This food has been said to boost protection against bad bacteria and viruses. All while strengthening the immune system. It is even claimed that it can aid in DNA repair, thus postponing aging. Most dogs’ owners wouldn’t care about their pets looking old, but it’s supposed to also assist in faster wound healing. So, the answer to the question in hand is yes. Broccoli is good for dogs. Dogs will enjoy chewing on the stem in a bone-like fashion. This vegetable is considered to be highly beneficial for dogs. That is, as long as its consumption doesn’t comprise more than 5-10% of the overall diet. So, in small amounts, it is a very good idea to let your pup have some broccoli. If you are afraid that the stem skin’s fiber will get stuck in the dog’s throat, cut it off. Otherwise, just give him the florets. It is healthy, low-calories-and-fat snack. This is a snack full of antioxidants, vitamins, and minerals. Why Is Broccoli Bad for Dogs? Broccoli belongs to the cruciferous family. The vegetables in this family are rich in vitamin C, nutrients, soluble fiber and phytochemicals. 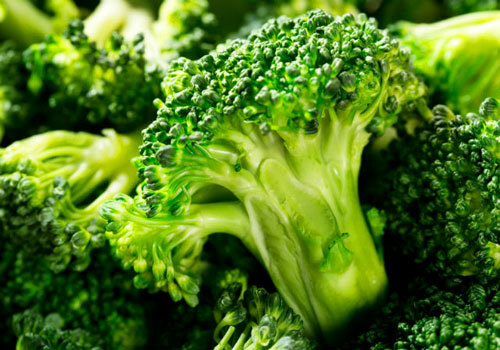 Chewing cruciferous veggies, broccoli for that matter, will result in the formation of isothiocyanate. This element causes severe gastrointestinal irritation in dogs. If broccoli consumption is more than 25%, the result may be lethal. 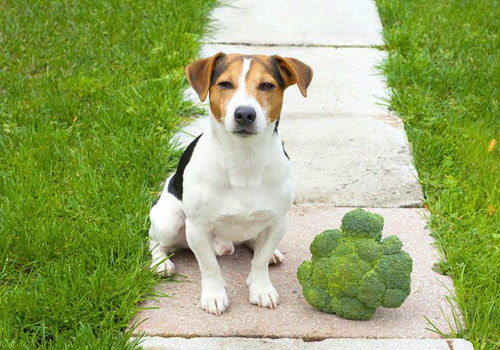 Dogs with goiter better avoid eating broccoli altogether as it can severe their condition. 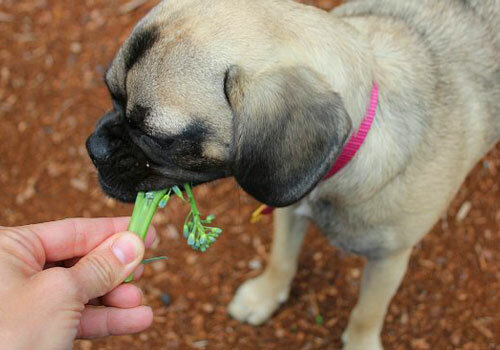 So, while we love the multiple benefits of our dogs eating broccoli, we must be cautious. Canine’s intestinal system works in a slightly different manner than our own. For humans, a higher intake of cruciferous vegetable will only trigger a better response. In dogs, however, it leads to potential harm. It’s ok to have your dog eating broccoli as long as it’s been supervised. Don’t just give him a whole head and let him get on with it on an everyday basis. It’s fine to give your pooch this super veg daily. But then, make sure it complies within 5-10% rule. Considering this range, the broccoli intake would merely be a tenth or twentieth of the everyday diet. Divide your pet’s feeding quantities into ten to twenty equal parts, even if only mentally. Then you will have a clear estimation of how much it is ok for you to give them. If your dog has eaten too much broccoli and exhibits these symptoms, action on your behalf will save his life. Info about the agent, aka the broccoli. What, when and how much? These might seem irrelevant to you when your dog is in critical condition. But they are, in fact, very important factors which will help the vet to determine the line of treatment. How to Prepare Broccoli for Dogs? There is no only one way to prepare and serve a broccoli for dogs. Presumably, if this isn’t your first time giving him the vegetable, you already know if his favorite dish comes raw or cooked. If, however, you don’t, then you can be as creative as you like, well, almost. If you go raw, then wash it well and serve cut up or whole. If it is a ready-made broccoli meal, watch out for some special sauces it might be accompanied with. While dogs and broccoli mix well, dogs and sauces are not really. Some things, like butter, mayonnaise or mustard might upset the dog’s stomach. Salt and sugar, too, are not highly recommended. If it is a self-made version that you are aiming for, then cook, boil or steam it. Steaming will keep in all of the nutrients. It will still soften the veg, making it more approachable for your dog’s teeth and gums. Older dogs or those suffering from mouth sensitivity of some sort will appreciate it. You can cut it conveniently into smaller pieces, to prevent choking, especially if it is given raw. Mixing it with another vegetable or leafy green is a wonderful idea. A nice meat meal accompanied by a few chunks of broccoli will leave your pooch in a good state. You can put a tiny bit of salt in, just for the taste of it. My Dog Ate Too Much Broccoli! What to Do? We want to be sure that we are on the safe side with our dear pooches snacking on broccoli. For that matter, we have to know how much is actually too much. When it comes to deciding on how much of this veg is fine to give, we must look at the size of the dog. Smaller dogs can have less while bigger accordingly. For a Yorkshire terrier, one head of broccoli may be toxic. For a Great Dane, as oppose to that, it would just about scratch the palate. As mentioned previously, 5-10% is what broccoli should compile to of the daily food intake. More than that might seriously upset your dog’s stomach. Exceeding the 25% limit might send the dog into severe toxicity and even be fatal. As good as broccoli is for dogs, we must remember that it can be dangerous, too. There is such thing as too much of a good thing. In fact, many medicines work that way. If we treat broccoli as a medicine, due to all of its healthy potential, we will do well actually. We all know by now that overdose is harmful. Amounts are crucial to remember when considering broccoli for puppies. They are much smaller and can sustain only a bit of this powerful vegetable. Perhaps one floret is all your pup needs. Watch this dog eating broccoli video below. Check how much Toby, The Pug, love eating Broccoli. Below are the 7 most frequently asked questions people wonder upon when considering feeding broccoli to their dogs. Answering them will hopefully clarify the mist. Knowing the facts about broccoli and dogs is always of help when venturing into a new taste-zone with your omnivorous friend. 1. 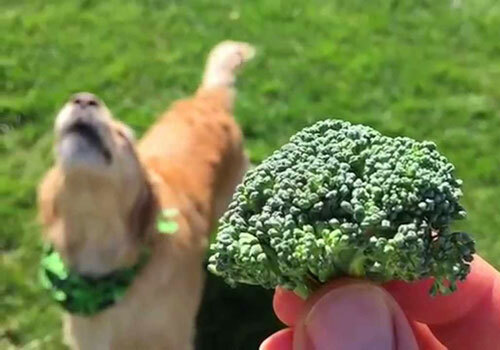 Can dogs have broccoli? Is broccoli safe for dogs? 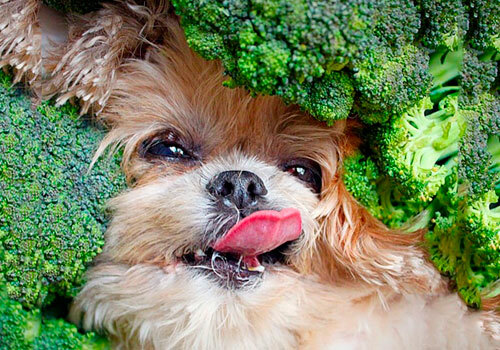 Yes, dogs can certainly have broccoli. 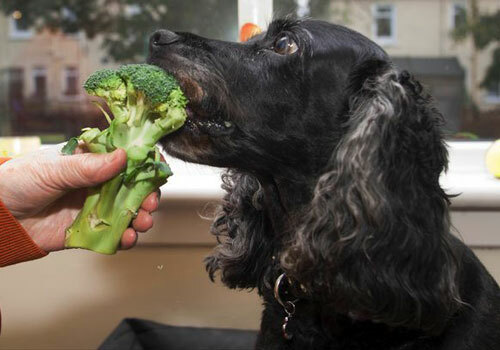 Broccoli is beneficial for dogs as it is for humans. There is such a thing, however, as too much of a good thing when it comes to broccoli and canines. This vegetable is safe as long as only a bit of it is given. Small amounts go further. Aim to give less than 10% of the dog’s overall daily food intake. That should work just fine. Bear in mind the dog’s size. Dogs with goiter are better off without broccoli. 2. Can dogs eat raw broccoli? Eating raw broccoli is absolutely fine while it is within limits of the correct amount. Some pups enjoy chewing on the stem as if it was a bone. It is a healthy snack, which dogs will take real pleasure in devouring. Raw broccoli is abounding with vitamins, fiber, and nutrients, all of which are good for your dog. 3. Can dogs eat broccoli stalks? Stalks of broccoli are not a food waste. These bits are high in iron, calcium, potassium, magnesium, vitamin A and even protein. It is assumed to possess anti-cancerous properties. Stalks can definitely be eaten. 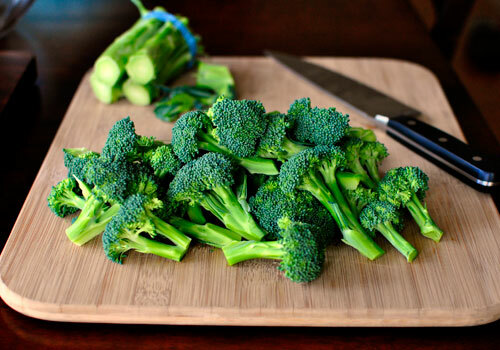 Again, as the rest of the broccoli, it can be given raw, cooked, steamed or boiled. 4. Can dogs eat broccoli stems? The stems of broccoli can be chewed on and eaten, too. Dogs will treat them as a bone. The stem carries vitamins and nutrients just as the rest of the broccoli. Excessive amounts will cause harm similar to other parts of the vegetable. If the skin is too hard for your dog to deal with, you can cut it off. 5. How much broccoli can a dog eat without getting sick? And how often? Recommended amount of broccoli for a dog is 5-10% of his food intake per day. Monitor your dog and pay attention to any unusual behavior, vomiting or loose stools. 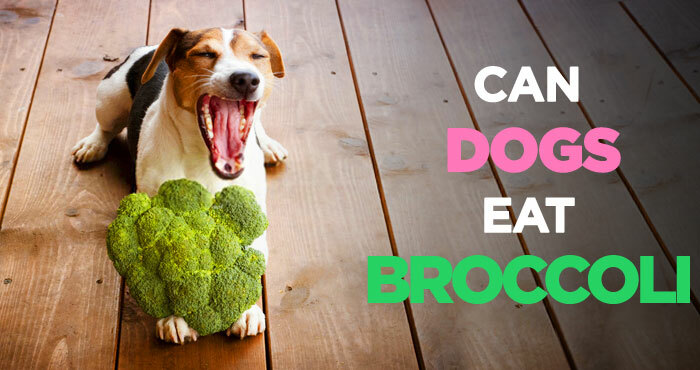 If your pooch appears to be his regular happy self and keeps asking for it, you can give him broccoli even every day. Comply within the recommended daily limits, though. 6. Does broccoli give dogs diarrhea? If your dog had had too much of the vegetable, it might cause him diarrhea. Loose stools is a sign that you should cut back on feeding your pooch this super-veg. Butter, mayonnaise, mustard and various sauces that are combined with broccoli dishes sometimes can cause diarrhea, too. When treating your pup to broccoli, avoid these sauces. 7. Can puppies eat broccoli? Puppies can enjoy this leafy green same as adult dogs. For puppies, however, a lesser amount should be given, considering their size. Measure their broccoli intake carefully since it is simpler for them to have too much of it. Cut the vegetable into small pieces to prevent choking. One floret a day might be all these little ones need. To wrap the subject up it is sufficient to say that broccoli is a super vegetable which dogs may benefit from, too. 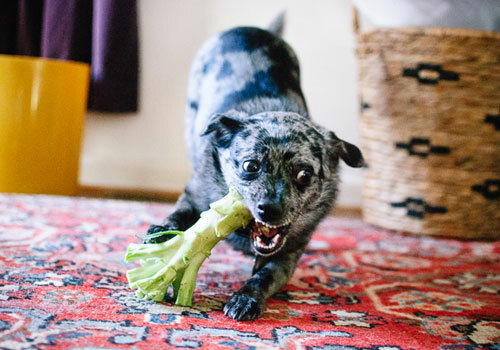 The answer to the question ‘Can dogs eat broccoli?’ is a definite yes. The broccoli has many health-benefiting potentials, including fighting cancer, cell regeneration, strengthening the immune system and supporting overall nutritional balance. It is, however, possible to overdo it. For that reason, broccoli’s consumption must remain within the 10% of the dog’s overall daily diet. All of the parts are edible: stem, stalk, and florets. The vegetable can be given raw, cooked, boiled or steamed. Smaller dogs should have less. Serve it as it is or mix with other veggies or meat. Bone appetite. My dog LOVES his veggies, broccoli included. When I make our nightly veg, I make him a small bowl too!